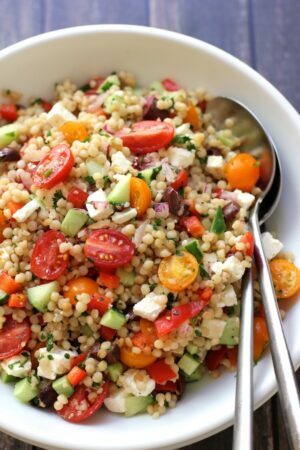 An easy, flavorful summer salad with a Mediterranean flair featuring Israeli couscous and chopped summer vegetables. This Israeli couscous salad with summer vegetables is an easy, flavorful dish with a mediterranean flair. It has sweet cherry tomatoes, cool cucumbers, crunchy red peppers, salty feta and olives. It’s tossed with a zesty red wine vinaigrette. 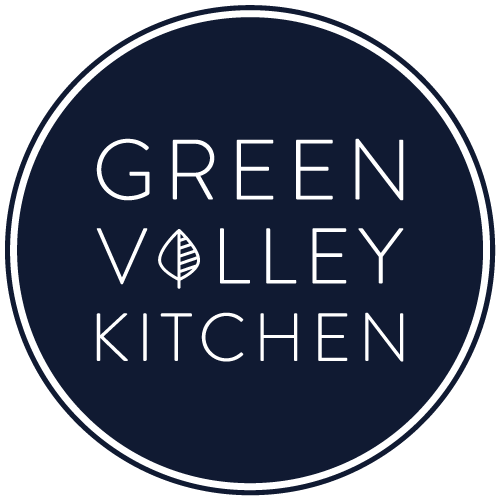 The salad comes together quickly – you prep the veggies as the Israeli couscous is cooking – and your dish is ready in about 20 minutes. Israeli couscous – also called pearl couscous – is larger and chewier than regular couscous. In fact, Israeli couscous is really pasta. It is a small, pearl shaped pasta that is toasted before cooking. Toasting the couscous gives it a lovely nutty flavor. I used Israeli couscous that I bought at Trader Joe’s. I used to skip the step of toasting the couscous and that was a mistake. By toasting the Israeli couscous, you give it a light nutty flavor that really enhances the recipe. After toasting the couscous, you are going to be adding water to the pan – it will boil/bubble right away since the pan is hot. Be careful because it may splash up and splashing hot water is not good. Once you add the water to the pan, turn down the heat to low right away. If you cook the couscous on medium or high heat, the couscous will end up being struck to the bottom of the pan. This Israeli couscous salad with summer vegetables refrigerates really well. Make a little extra so you can bring it to work for lunch the next day. I like to soak the red onion in a little water before mincing. This reduces the raw onion taste. So slice off a piece of onion and add it to a small bowl of water before you start dicing your other vegetables. If you make this recipe and enjoy it, come back and let me know by leaving a comment below! 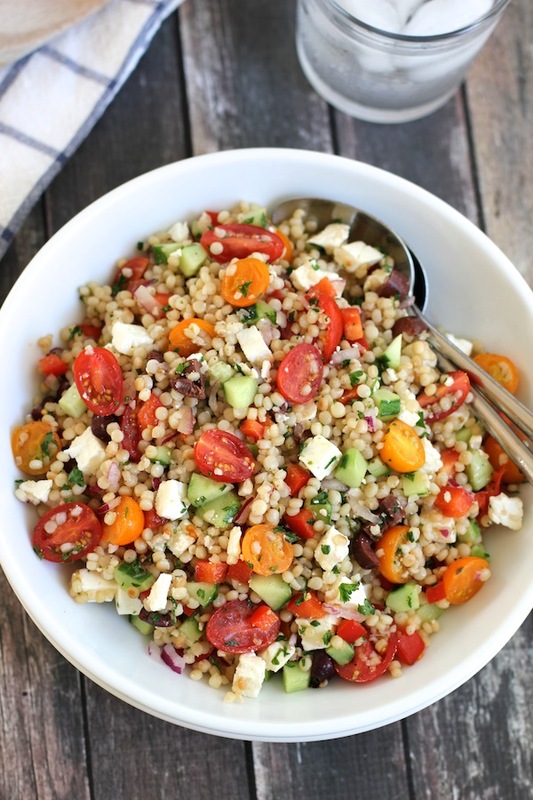 An easy, zesty summer salad with a Mediterranean flair featuring Israeli couscous and chopped summer vegetables. Heat a sauce pan over medium heat and add one tsp of olive oil. Once the oil is warm – about 30 seconds – add Israeli couscous and stir for a minute or two until Israeli couscous is slightly toasted. When couscous is toasted – add 1 cup of water and chopped up bouillon cube. Be careful, the pan is hot and the water will probably instantly come to a boil, pour carefully so it doesn’t splash up. Turn heat down to low and simmer couscous for the amount of time on package instructions. While couscous is cooking, dice red pepper and cucumber – you want the dice to be roughly the same size for both. Add to a large bowl. Next, slice cherry tomatoes in half and add to the other vegetables in the bowl. Mince parsley and red onion. Add to the vegetables in the bowl. Roughly chop olives and add to the bowl. Dice feta cheese and set a side. Whisk olive oil, red wine vinegar, honey, black pepper and salt together. When Israeli couscous is ready, add to a fine mesh sieve and rinse so that the couscous cools. Shake the fine mesh sieve thoroughly so that the couscous is fairly dry. Add Israeli couscous to the bowl of vegetables. Add the dressing and toss to combine. Add feta cheese to couscous and vegetables and toss gently to combine. Thanks for stopping by – hope you enjoy the recipe. You can find me on instagram and pinterest too! Making this weekend with roasted bell peppers instead of fresh so see how we go ! Hope you like it, Josie! Made this with extra fresh herbs and summer veggies – fresh brined feta. To die for!!! I like the idea of dried cherries in this although I am serving it tonight along side fresh corn on the cob and Colorado peaches. Hi Petra – sorry for the late reply – so glad you enjoyed this recipe! It’s one of my favorite. The idea of dried cherries is very intriguing – will need to try that. Thanks for leaving a comment! The first time I made this, I was searching for a recipe to use the tricolor couscous I had in my pantry. I found this recipe and although I did not have pearl couscous, I decided to try it anyway. I loved it to death. I did not change anything else about the recipe at all except for using tricolor couscous instead of pearl. I loved it so much that I made it a second time that same way. Last night I made it for a third time using pearl couscous this time. I still love it but I actually prefer the tricolor couscous instead even though the texture is completely different. I would make this a thousand times more but I think I will use the tricolor couscous from now on. So delicious! Thank you for this amazing recipe. Hi Lauren – thanks so much for leaving such a great comment! So glad you enjoyed this recipe so much. I will have to look for tri-color couscous at the market and try that the next time I make this. I really appreciate you coming back to leave a rating and review – you made my day! This was a delicious main for me and a side for the meat eaters in my family alongside grilled salmon. I used more vegetables than the recipe called for, because ore vegetables in everyone’s tummies is always better. Next time I might add a little finely minced fresh mint too. Thanks for a great recipe! Thanks so much, Vivian. Glad you enjoyed it and thanks for letting me know by leaving a comment and a rating – I appreciate hearing from you! This is an easy to eat salad. All the ingredients meld together deliciously. Thanks so much! And thanks for leaving a rating – I appreciate it! I came across your recipe just last month and I am making this salad for the third time. I love it! This batch will be to share at a potluck lunch tomorrow. Thanks so much for letting me know, Sandra – I love this salad too – it’s perfect for a potluck or get together with friends! I made this today. I subbed a few things because it is what I had. I used real chicken broth instead of water and veggie bullion. I don’t like the taste of veggie boullion or broth. I used small shallot instead of red onion, and cilantro instead of parsley. It was addictingly delicious! Thanks, Diana – glad it worked out so well for you! I love the idea of cilantro – I’ll give that a try the next time I make it. Made this with whole wheat Israeli coucous and it was amazing! That’s great, Lucy! I’ll have to look for whole wheat Isreali couscous – I haven’t seen that in the markets – but it sounds like a great addition. Thanks for taking the time to let me know you enjoyed it – I appreciate it. First i would like to say that the recipe is vey good and tasty, but i would like to correct you on two things. Coscos is made of semolina, what you are useing in the recipe is called PETITIM which is a kind of egg less pasta. Because it is similar in its shape to Coscos its ” nickname” is coscos. Hi Hodayah – Yes, this recipe is definitely mediterranean in flavor. Thanks for the info on Petitim – I’ve never heard of Petitim and had to look it up! Glad you enjoyed the salad. Have a great day. this sounds like a great summer dish and as the weather is starting to heat up again, i will keep this recipe in mind. i do love cous cous. Thanks, Sherry. Hope you enjoy it! Fabulous Geraldine, never had Israeli couscous before, it’s delicious, helped maybe by my feta which had dried cranberries in it. I love Israeli cous cous – I don’t think it gets as much attention as it deserves! This looks like a delicious and refreshing meal, and I love all the colorful veggies. I agree that it would be great for lunch! Thanks, Julia. I’m definitely adding this to the lunch rotation. Have a great day! Hi Crystal – I agree – I sometimes forget about Israeli couscous and then when I eat it, I think, why don’t I make this more often :). Have a good one! Geraldine, I am so excited to learn about Israeli couscous! I haven’t tried it… it just hasn’t been on my radar, but I love regular couscous, so this must be fantastic! Looking forward to toasting up some couscous and preparing this beautiful salad! Your photography is stunning! 😀 Thank you for sharing this recipe! Hi Traci – go get yourself some Israeli couscous – it’s completely different from regular couscous but you’ll love it. Have a great night!